In its day, the Aveline House was the city's most elegant hotel. In the end, it was the city's most elegant deathtrap. 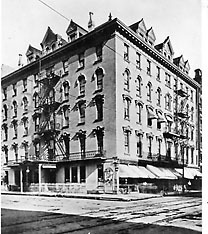 The hotel was built in 1863 at the southeast corner of Calhoun and Berry streets by Francis Aveline. Aveline had come to Fort Wayne from Vincennes in 1820 and eventually became one of the city's most important contractor-builders. His name might have faded into oblivion, however, if not for the luxurious hotel which bore his name. The Aveline House was originally a four-story hotel. Two floors were added later. Because of its central location and fine accommodations, the hotel played host to scores of important guests and functions. Then, one gray morning, everything ended for the Aveline House. At about 3:30 a.m. on May 3, 1908, as 70 guests slept, a fire broke out at the bottom of the elevator shaft. The flames soon burst from the hotel's windows and spread throughout the building. Some residents escaped through the door and safely made it to the street. Others found safety by going to the roof, where they jumped onto the tops of neighboring buildings. Others in desperation leaped from the windows. Some landed safely, others didn't. In all, 11 people died in the Aveline House fire. In loss of human life, it was the worst fire the city ever had. One photograph, taken when the blaze was at its peak, shows an old horse-drawn steam fire engine; that may indicate why it took so long to put out the flames. Other pictures taken hours later show the huge crowd that gathered around the burned-out hotel's shell following the fire. More than 1,400 people, brought in by excursion train, soon were on hand to witness the hotel's demise. Once the final flame died, it wasn't long before the old Aveline House was torn down. Like the hotel which bore his name, Francis Aveline's final days were also marred by tragedy. Fort Wayne historian B.J. Griswold wrote that Aveline literally died of grief following the death of his son, Frank, in an 1865 Civil War battle near Chattanooga, Tenn. In a way, the hotel actually had a better fate. It went out in a blaze of glory, at least. Other, later Fort Wayne hotels were either allowed to stand empty and forgotten or else were dynamited to make room for hamburger joints.